Low-tech meets science fiction in “Baby Universe (A Puppet Odyssey),” written and directed by Kirjan Waage and Gwendolyn Warnock for the theater company they co-founded in 2001, Wakka Wakka Productions. Set on an unnamed planet in some apocalyptic future where the sun has burnt everything to a crisp and the last remaining inhabitants huddle in underground bunkers, the story focuses on the efforts of scientists to generate a new universe out of synthetic pods they grow in laboratories situated in the single tower left standing above ground. They struggle for survival against the formidable adversary of an exhausted universe ready to call it quits. The video projections are a bit murky and the sound score unexceptional. The script never really departs from the standard-issue science fiction apocalypse fantasy so remains the least interesting element of the show, but it serves its purpose as a framework for highly theatrical storytelling. 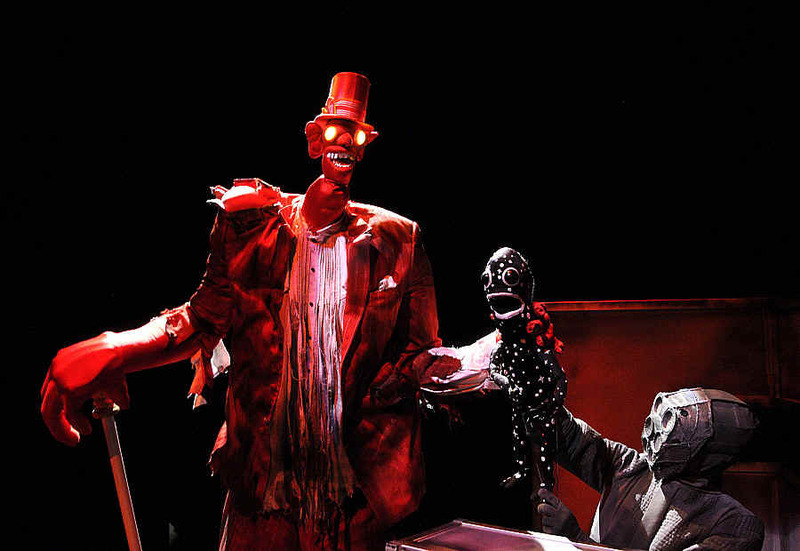 Waage and Warnock’s imaginative visuals and free-form playfulness impressed me and reminded me what a hotbed of inventiveness the world of puppet theater is. “Baby Universe” conjured up memories of my earliest exposures to the kind of cutting-edge puppet theater that goes beyond kids’ shows. The late great Charles Ludlam created a short-lived sci-fi serial called “Anti-Galaxy Nebulae” which basically consisted of manipulating odd pieces of tubing and fabric, like kids making magic out of nothing. And when Julie Taymor first started making theater in New York, fresh from a post-graduate fellowship in Bali, she put on a beautiful strange piece called “Way of Snow” which used everything from rod puppets to shadow-puppets to paper cutouts to tell a tale about cultural dislocation. Like Taymor, Waage and Warnock both studied at the Ecole Internationale de Theatre Jacques Lecoq in Paris, a legendary way station for experimental theater artists and a lineage that bodes well for these emerging artists.